You review a couple of games for the MRC, and sure enough... They take advantage of your kindness. Somehow they've gotten it in their heads that I'm "the MRC review guy", so I find myself reviewing pretty much everything that comes in at MRC HQ. To make matters worse, they've even started spamming my mailbox when I dare to take too long writing a review. Well, truth be told, this review did take a little longer than usual; Yupipati was actually released in 2004. Yupipati is a nice Spanish production by a group called Paxanga. It's basically Paper-Rock-Scissors on steroids for your MSX. Yupipati comes in a nice transparent case, similar to those used for ZIP disks. The case, which has a nice full-color inlay, holds the DD disk itself, and a small manual. This manual is one of the nicest manuals I've seen in amateur productions. While very small (the size of a disk) and just 20 pages, it has a nice cover and all pages are full-color as well. I assume (due to the costs) all of this was home made, and I must say it was very well done. Clearly a lot of attention was given to this part of this production... Kudos! The manual clearly explains everything you need to know to get started, and everything is nicely illustrated with screen shots where needed. It also mentions there is a text file on disk with more-detailed information. The whole thing is in Spanish though, so the linguistically challenged may need to point their browsers to babelfish and pull that text-file through. (note: From what I've heard though, an English version of the manual was also made, making life a little easier for the rest of us here in Europe.) The dual-density disk bears a nice color logo as well, the same one as the one on the manual and cover. 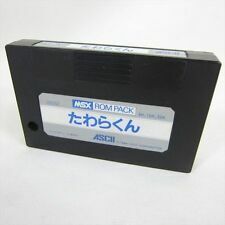 Yupipati will run on any MSX2 system with a DD drive and at least 128kB RAM and VRAM. The game also works with DOS2, allowing you to install it on a Compact Flash card or a harddrive. According to the authors, it was tested on MSX2, MSX2+ and Turbo-R and didn't cause any problems. While I did give the game a quick test on hardware, openMSX was used for this review, in order to take the mandatory screen shots as well. 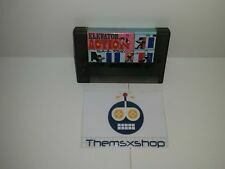 The game was made in Nestor Basic, and starts with the AUTOEXEC.BAS that's on the disk. Copying the whole lot to your harddrive or CF should also be possible. Paper, rock, scissors... How hard can it be? Well, actually, quite hard. The first time I took a look at this game I would last for a little more than a minute before being humiliated by the AI of a 30-year-old 8 bitter running at a clock-speed you can count with the fingers on your hand. Fortunately, I later discovered the 'Relax mode' of this game, which takes the edge of all the frantic finger flicking. Okay, so paper beats rock, rock beats scissors, and scissors beat paper; that much I knew... Of course there's a little more to this game than that. The idea is that you play against an adversary (be it the computer or a human player) and you launch any of the 'paperrockscissor chips' at them. Your adversary must then counter your attack, by launching a chip of their own. All this is done on 8 'rows' that can be used to attack on. The idea is that you beat all of your opponent's chips, reach their side of the screen, and damage them. Using just paper, rock and scissors you would probably always get a tie, so there's a twist. You have to select your chips from your 'store' of chips, which is (I guess) randomly generated. This means that you can run out of a certain type of chip. Apart from that, there's more than just these three chips. There are blockers, stars, freezers, power-ups, dynamite and a number of other chips that add to the action. Apart from that, you can discard one of your own chips, swap the two attack chips on a row, bomb the heck out of your opponents chips and place random chips on the playfield. Using all these chips, you have to attack your opponent, who also places chips on the playfield. Each time you place a chip, that particular row of chips advances. When your chips reach your opponent's chips, they collide, and only the strongest chip survives. If both chips are equal, or one of the chips is a blocker, the row gets 'stuck' and neither of the players can place new chips on that row until one of the players destroys either one of their own chips, or bombs the opponent's chips on that row. If you manage to destroy all your opponent's chips on that row and reach their side of the playfield, you can start damaging them. It's all a bit hard to explain, but perhaps the screen shots give a better idea on how this works. The graphics are nicely done. While they're certainly not spectacular, they look nice enough and are definitely more than adequate. They look a little like the Japanese Super Deform style, and are 'funny' enough to give the game a nice and light feel. The animations are a bit simplistic though, but I can't say it really bothered me. Naturally, it's always nice to see software that's DOS2 compatible and installable to harddisk as well. Another thing you don't see too often in MSX games is a tutorial mode. This nice feature, hidden in the options screen, gives a step-by-step explanation of the game. While this part of the game is in Spanish as well, you don't really need to understand what's said in order to follow the rules of engagement. Just watching the game unfold already gives a pretty good idea of how things work. It was nice to see a little option like this though, since -like said- Yupipati can be horribly confusing at first. While nothing really bothered me about Yupipati, there are of course some points of criticism. The one thing I found odd about the game, is that I wasn't able to return to the title screen after a game had started. I tried pretty much every key I could think of, but short of losing the game, I couldn't find any way of returning to the title screen. The music could just as well have been a tad better, though it's certainly not bad. It also would've been nice if the animations had been a little smoother, something that probably could have been implemented. I don't know if this is machine-specific, but I had to boot Yupipati while holding CTRL. Personally, I don't think that's really something you'd want to see in a game from the year 2004, but it would appear that things like these do still, uhm, happen. It would've been nice to see the game boot directly from disk. Due to a lack of hardware, I didn't get around to checking how well the game runs from CF or Harddisk. I'll just assume that the authors checked this part of the game well enough, and that in case of DOS2 the game does not require you to boot with CTRL. There's always a number of sure things that can make a game better. The music could've been a bit better, and it would have been nice if the game had had MoonSound music. On the other hand, I guess MoonBlaster Stereo music is still adequate and more commonly available. Animations could have been a bit smoother, and the game could really use a key that allows you to return to the main menu. If such a key does exist, I certainly couldn't find it. It's also better of course, if a game can boot without having to hold CTRL. This probably has something to do with the fact that the game is largely made in (Nestor)Basic, but still isn't very handy. Like said though, using DOS2 may solve that problem. Hmm, if you're testing with openMSX, you can also test installation to harddisk with the IDE emulation feature. Most likely you also need to press CTRL then, as it is a basic game. Funny to see a game that is completely based upon Jan-Ken. The picture of the package could as well have been redone into a better one. I hope it will be done in time though. Well, I like Yupipati. I consider it an original game with some interesting concepts. And the CTRL thing does not bother me at all. About CTRL, the game main program was made, remade and then recompressed to fit on 9ks, because the doomed Xbasic takes a lot of ram when it compiles (and I don't have technical info about how Xbasic internally works). But I will fight no more againts Xbasic limitations, I will make next games in ASM (all ASM I can, at least). It's easier than understand Xbasic internal working.